WOW! I don't think I'll recognize Donny with a painted body! It looks pretty sweet! Now you know, you have to have a nicely painted body for the rest of the year, no more asphalt bodies! Clint-You better print out that list and frame it because that's the only time you'll ever be on top! You could also tape it to your pit box so you could see it everytime you reach for a tool...lol!! Are you going to the Ripon race next month before the Reedy? I'm planning on making a trip back to the old stomping ground, is anyone else going? Let me know. Re: New Paint for Donny! There are quite a few of us that can't wait to run out at Ripon again. It will be some nice practice on a flowing track. You bringing the skittles???? Either way, Superior has them. Just ask Mike or Ben when you go in and tell them you want the ones Rashaad ordered. When are your shock towers going to be available? Is the geometry the same as the carpet towers? The skittle bringer will not be with me. But I will try to bring Hodapp and Furutani if they'd like to go. Do you know if the race will be in the day time or night time like old times? I've heard Nevada is liking his new Yokomo, what do you think? I had my first race with the Mi2 last night and I was very impressed. Does anyone know what other springs fit the standard shocks? I would like to run something softer than the kit Blue springs in the rear - but Schuie's Grey springs may be too soft (10 rate?). I have some springs that I can try but they're a lot shorter than the kit springs - so I'm not sure if the shock collars can be screwed down far enough. 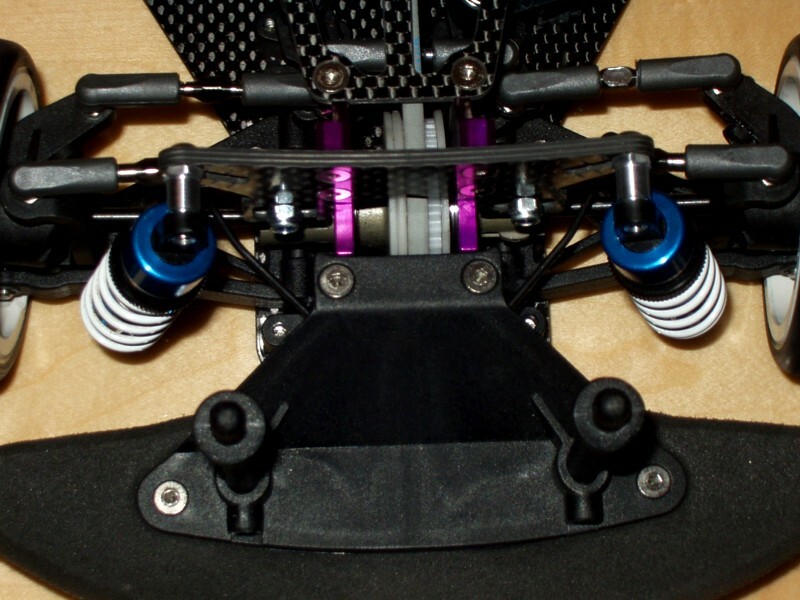 I was talking with another Mi2 driver about the riser plates and what effects this has on the car. My understanding is that lowering the suspension mounts on one end of the car will lower the roll centre, thereby improving the grip - Is this correct?? If this is correct, then why not simply remove the riser plates altogether from both ends of the car - theoretically increasing grip at both ends? Finally, if I need more mid-corner steering on fairly tight corners - where should I look to make adjustments? As far as springs go the pretty soon to be old Losi springs fit on the kit shocks. If you go with shorter springs you can add the AE thick spacers from the days of non threaded shock days They will take up some space and you shouldn't run out of thread for any adjustments you make. Everyone liked their Yok until the first crash. This thing tweaks too easily. It's still a struggle for some of the fast guys out here. Lil Alex and John have their work cut out for them. The car needs to have the top deck screws counter sunk. Oh well.....The MI2 took TQ and the win yesterday and today at RCCAR I hope to do the same. and how much are they, the bmi ones? I noticed that a lot of the team guys are changing their ball cups from the stock ones that come with the Schu to bigger Losi looking ball cups. Is there a reason for this other than they are offered in Schu purple :-)? You don't always want more grip. If you were to lower the roll centers too much, you could get the car really pushy. You'll hear people say the car is too stuck. Basically the car is not free enough to flow through the corners. Having the roll centers raised a little will usually help free the car up to flow through the corners better. If the car is pushing on entry, lower the front roll center, if you're loose on exit, lower the coll center. The opposite is also true, too aggressive on entry, raise the front, too tight middle to exit, raise it a little. Jon, how is the BMI chassis working for ya ? All times are GMT -7. It is currently 05:52 PM.